For convenient, grab-and-go menu items, the Broaster Express program offers a wide variety of foods – anything your customers could want! Broaster Company offers foodservice operators all they need to strengthen their businesses and build their profits. 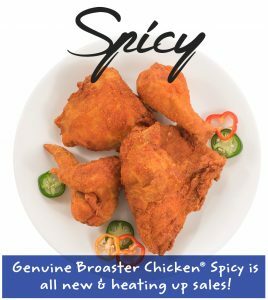 When you become a Genuine Broaster Chicken licensed trademark operator, you gain access to all the benefits, supporting supplies, marketing Point of Purchase/Point of Sale (POP/POS) materials, and accessories that you need to be successful. If you’d like to attend an on-site training seminar to learn in-depth instruction on how to prepare and cook genuine Broaster chicken, market your business, and be instructed on the proper way to clean and filter while trying different foods, then contact Taylor Freezer of Michigan today.